The State of State Fairs, Part III: North American Midway Entertainment at the South Carolina State Fair, Mighty Thomas Carnival at the Utah State Fair, and Lowery Amusements at the State Fair of Louisina. Do You Remember The Hurricane? Do You Remember·Classic Food Concession Trailers? Do You Remember Trolley Rides? Do You Remember The Lindy Loop? Plus our regular monthly features: Direct from the Lots, Midway Talk, Carnival Transport, Now Booking, Concession Stands, Marketplace for Showmen and Classifieds. 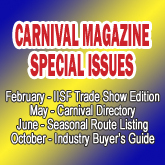 Plus our regular monthly features: Direct from the Lots, Midway Talk, Carnival Transport, Now Booking, Model Construction, Marketplace for Showmen and Classifieds. Michael Prelesnik tell us of the many reasons that it pays to buy American carnival rides. In Michigan the carnivals go on and on, even in the dead of winter.